The first one is Bayer AG of Germany, which made a friendly takeover of Monsanto. The reason for this was that Monsanto became identified in the public mind as pure evil and everything bad about GMO’s, which was accurate. This became a burden on the whole GMO project. So, Bayer stepped in, which has a friendly image of an aspirin, harmless, nice company, but in fact is the company that invented heroin in the 1880’s and made gas for the ovens of Auschwitz during WWII. It’s one of the dirtiest agribusiness companies in the world with a series of homicides and pesticides that killed off bee colonies and many other things that are essential to life and to nature. ChemChina – China State Chemical giant – for some reason took over Swiss Syngenta, which makes weed-killers. Then, Dow Chemicals and DuPont merged their GMO businesses together. So, we have three gigantic corporate groups worldwide controlling the genetically-modified part of the human food chain. As dangerous as the GMO crops are and the more they sell, it is becoming more and more obvious that they are the chemicals that by contract must be applied to those GMO seeds by the corporations. They demand that if you buy roundup ready soybeans or corn, you must use Monsanto (now Bayer) roundup. Therefore, this is giving more corporate power to the GMO industry than ever before and that’s an alarming trend. They are putting pressure on the bureaucracy in Brussels. One example: there was a massive public campaign against the renewal of the license of the European Commission for Glyphosate. Glyphosate is the most widely used weed-killer in the world. Glyphosate is the main ingredient in Monsanto’s roundup. The other ingredients are Monsanto’s corporate secret, but the combination of them is one of the most deadly weed-killers. The World Health Organization’s body responsible for assessing genetic dangers made a ruling the last year that Glyphosate was a probable cancer-causing agent. The license came up for automatic renewal last year – a 15-year license. The EU commission for health was prepared to automatically renew it for 15 years. The European Food Safety Authority (EFSA), which is responsible allegedly for the health and safety of European citizens, recommended approval based on a German study by the German Food Safety Agency that was simply lifted 100% from studies given by the private corporation Monsanto! So, the whole chain was corrupt from the beginning and all the information was rigged. In reality tests have shown that in minuscule concentrations, lower than in recommended levels in Europe and in the US, Glyphosate causes kidney disease, liver disease, and other illnesses that are potentially fatal. Now, Glyphosate has shown up in urine tests, in urban drinking water, in gardens, in ground water and so forth. And that gets into the system of childbearing women, for example, with embryo. It’s all in this! The EU commission, despite a million petitions – this is a record setting – and despite recommendations from leading scientists around the world to not renew the license, made a compromise under huge industry pressure and renewed it for 18 months. Why did they renew it for that time? Because at the end of 18 months, they were told by Bayer and Monsanto that the takeover of those two giant corporations will be completed and Bayer is going to replace Glyphosate with another, likely more deadly toxin, but not so well-known as Glyphosate. So, they simply bought time. And that is just one example. This agenda of GMO is not about the health and safety; it’s not about increasing crop yields – that’s a lie that has been proven in repeated tests in North America and all around the world. Crop yields for farmers, using GMO plants, may increase slightly for the first 1-2 harvest years, but ultimately decline after 3-4 years. And not only that! We’ve been promised by Monsanto and other GMO giants that the use of chemicals will be less, because of these “wonderful” traits that GMO plants resist. In fact, the weeds become resistant and you have super weeds, which are 5-6 feet in a height and choke out everything. It’s a catastrophe. So, farmers end up using added weed killers to kill the super weeds. This whole mad playing around with the genetic makeup of nature is a disaster from the beginning. The real agenda of GMO, which I have documented in great detail in my book “Seeds of Destruction”, comes from the Rockefeller Foundation. It comes out of the 1920s-1930s Eugenics movement. 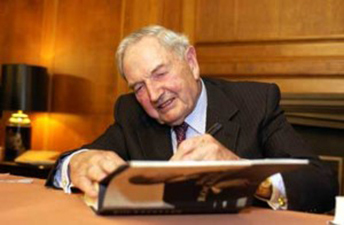 The Rockefeller Foundation during the 1930’s, right up to the outbreak of World War II when it became politically embracing too, financed the Nazi Eugenics experiments of Kaiser Wilhelm Institute in Berlin and in Munich. Why did they do this? Their goal was the elimination of what they called “undesirable eaters”. That is called population reduction. After the war, the head of the American Eugenic Society, who was a good friend of John D. Rockefeller, at the annual conference of the American Eugenic Society said: “From today, the new name of eugenics is genetics”. Moreover, if you keep that in mind – genetic engineering, the Human Genome Project and so forth – they all are scientific frauds. Russian scientists have proven that the entire Genome Project utterly disregarded 98% of the scientifically valuable data in favor of 2% that was completely nonsense and a waste of billions of dollars. Therefore, they have been obsessed with the idea of how to reduce human population in a way that would not be so obvious as simply going out and carrying out mass-sterilization. Actually, they have done that in Central America together with the World Health Organization by giving certain vaccines that they cooked-up to have abortive effects. Therefore, the women of child-bearing age in Central America were given these vaccines against tetanus. The organization of the Catholic Church became suspicious because the shots were given only to women, not to men. And they found that there was buried in the vaccine an abortive effect that made it impossible for women to conceive and bear children. This is all covert population reduction. These are the Western patriarchs who believe they are the gods, sitting on the throne with great dignity, controlling mankind. I think they are a bunch of fools, but they have this agenda of genetic manipulation. It’s against nature, it’s chemically unstable. And I have to congratulate the Russian Federation that they had the courage and the moral concern for their own population to ban GMO cultivation across Russia. That was a step forward for mankind. I would hope that Russia will use its influence to get China to do the similar thing, because their agriculture is in dire need of some healthy Russian input. But this step by Russia to make a GMO-free agriculture is a great step for mankind. The sickening, murderous practices of the abortion industry are increasingly being exposed by investigative journalists across the independent media, and what they’re uncovering is beyond unethical… it’s grotesque… even Stalinesque in its evil. This is just the latest in a jaw-dropping series of alarming revelations about the nefarious activities of Planned Parenthood and the “murder agenda” of the abortion industry. In previous investigations, Life Site News has unveiled how Planned Parenthood abortion centers harvest the organs of partially-born infants, murdering them in the process. I’ve just released a hard-hitting mini-documentary that explains how DEET insecticide is one part of a binary chemical weapon that targets your brain for destruction. The other part of that chemical weapon is found in carbamate pesticides which inundate the non-organic food supply. Once you combine these two, you get hypertoxicity to brain cells via “acetylcholesterase inhibitor chemicals,” leading to mass confusion, fear, memory loss and an inability to think for yourself. To put it plainly, Zika is good for business. As is the case with any major crisis, if you’re able to perpetuate enough fear, you can convince people to buy or go along with just about anything. In the case of Zika, that means harmful chemical exposure and experimental vaccination. 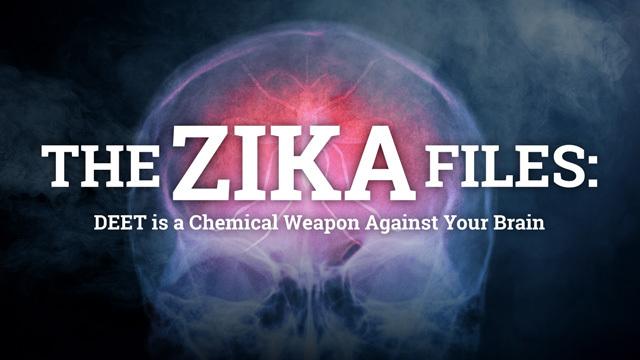 The Zika virus is simply the latest version of West Nile, Ebola, swine flu or even measles. If you take a moment to consider who exactly is profiting off these crises, you’ll see that it tends to be a repeat of the very same industries. “The manufactured Zika crisis is a windfall for chemical companies, vaccine companies and disease fear mongers. This is how they use tactics of info-terror to reap billions in profits while poisoning the people and the planet,” says the Health Ranger. Below is a list of industries and agendas flourishing under Zika. Since the Zika fear mongering first began, the public has witnessed a substantial increase in aerial spraying to combat disease-carrying mosquitoes, and Florida is being hit the hardest. Congress wasted no time in trying to pass legislation that would have weakened already weak regulations for dispensing harmful chemicals into the air, soil and water. House Republicans used the Zika hysteria to rebrand legislation that permitted the dumping of pesticides into bodies of water, violating key provisions of the Clean Water Act. They tried passing the bill on five different occasions only to succeed after renaming it the Zika Control Act in May. Although the bill was vetoed by Democrats in the Senate, “public health” agencies including the U.S. Environmental Protection Agency, the Food and Drug Administration and the Centers for Disease Control and Prevention continue to push for more chemicals. Miami is currently under a chemical assault thanks to recommendations from the EPA to spray a harmful insecticide linked to paralysis in animals. Mosquito control reported that it’s conducting indefinite aerial spray missions dumping a chemical called Naled. Naled is extremely toxic to humans and wildlife, particularly upon inhalation. Studies indicate that the chemical is 20 times more toxic when inhaled versus when ingested through food and water – and it’s prone to drift, traveling up to half a mile away from its original application site. The insecticide is deadly to aquatic life, as well as pollinator insects such as honeybees. In short, spraying Naled into the environment and on people does far more harm than Zika ever could. The most sickening part about it is that it’s not even effective! A study from the New York Department of Health found that aerial spraying of Naled reduced mosquito populations temporarily. But after 11 years of spraying, disease-carrying mosquitoes increased 15-fold. The government absolutely knows this, so why is it okay to douse people with a deadly insecticide that doesn’t work to kill mosquitoes? Profits, of course. Naled is made by an American company called AMVAC Chemical Company, owned by Vanguard Corporation. One of its subsidiaries is Environmental Mediation, which advises clients on how to win government approval for dispensing its deadly products. Another industry that has a lot to gain from Zika is the pharmaceutical industry, which has been working around the clock to fast track a vaccine that could ultimately be given to millions of people around the globe, including pregnant women. In June, Congress proposed spending $1.1 billion in taxpayer money to combat Zika, funding disease research, as well as vaccine development. 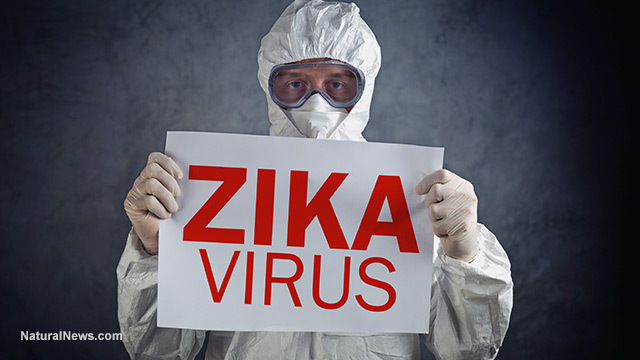 Researchers from Massachusetts Institute of Technology say that they have already developed a vaccine that is effective not only against Zika, but also against Ebola and swine flu. The vaccine is DNA-based, making it even riskier than traditional immunizations. The establishment’s assertion that Zika causes severe birth defects means pregnant women would likely be test subjects for vaccine experimentation – making some 6.3 million American women eligible for the controversial program. Ironically, the very company blamed for creating the Zika crisis is now profiting from it. Three years ago, the British biotech company Oxitec released thousands of genetically modified mosquitoes in Brazil to combat disease-carrying insects. The mosquitoes are genetically modified to contain a “self-limiting” gene that prevents the Aedes aegypti species from producing offspring. Oxitec says 95 percent of the mosquitoes die before reaching adulthood, preventing reproduction. But the math doesn’t quite add up. Oxitec said that the insects would decrease up to 80 percent of Aedes aegypti species. However, scientists believe that very same species is now responsible for spreading Zika. Despite speculation that Oxitec may have caused Zika to spread, the company expanded operations in Brazil, opening a new mosquito factory in Piracicaba. The insects were also released in Malaysia, India and the Cayman Islands. The Florida Keys may very well become the next destination pending approval from the state’s mosquito control district, which is set to vote on the proposal this fall. Another less obvious industry that stands to benefit from Zika is Planned Parenthood. People are so fearful about the potential of Zika-induced birth-defects that they’re willing to compromise their beliefs on abortion, according to a recent poll. Americans said that they would be okay with late-term abortions if the fetus was harmed by Zika. About 60 percent of respondents said women should have the right to terminate a pregnancy after 24 weeks if testing found signs of microcephaly, a birth-defect resulting in decreased head size – which the establishment insists is caused by Zika. Americans’ willingness to compromise their beliefs on abortion due to Zika could generate more profits for Planned Parenthood, the nation’s number one abortion provider.